While focusing on Islamorada this week, we looked at the Florida Keys Dining Guide for Direction to the nearest watering hole…. NEW! The Bayside Gourmet of Islamorada… Restaurant, Espresso Bar, Bakery, Deli and Pizzeria. A family owned and operated establishment, priding ourselves on the most authentic preparations of classic and contemporary cuisine. “This place is amazing!” Enjoy breakfast, lunch or dinner on the patio or eat indoors. We also offer free delivery from Port Antigua to Tavernier Creek. Located at MM 82.7, Bayside. Hog Heaven Sports Bar & Grill, the hottest late night spot in the Upper Keys! By day, Hog Heaven masquerades as a relaxed waterfront sports bar with some of the freshest seafood in town, indoor and outdoor bars and dining and a happy hour that can’t be beat. With 17 flat-screen TVs, you can be sure that most every game will be playing day or night. Once the sun goes down, Hog Heaven transforms into the hottest party destination in almost 100 miles. With a live DJ spinning every weekend and countless bands from across the globe. Hog Heaven is sure to put a little life back into your Islamorada vacation. Food is served daily from 11am – 3:30am and the party goes on until 4am. The Island Grill Restaurant, a favorite among locals, attracts patrons that enjoy a casual atmosphere and award-winning menu items including Tuna Nachos, BBQ Shrimp and our Spicy Tuna Roll. Three bars and indoor/outdoor dining allows you to have the perfect view of the Atlantic Ocean. You can always find a variety of live entertainment playing on the deck and on our own private beach in the back. We can accommodate large parties and even will host your next event! So, stop by the Island Grill where the food is great and the view is spectacular! Located in Islamorada at Snake Creek, mile marker 85.5, Oceanside. Come by car or boat, we have plenty of dock space! Lazy Days Restaurant offers oceanfront dining and Keys-style dishes. We guarantee you will be served the freshest seafood in town! Join us for a fabulous lunch or dinner. Voted Best Lunch, Best Waitstaff, Best Waterfront Dining and Overall Best Restaurant in the Upper Keys People’s Choice Awards. Now offering dining on the beach! Open 7 days. Conveniently located at mile marker 79.9 Ocean Side. Dance, eat, and relax in Keys casual style at the Lorelei Restaurant and Cabana Bar… The pulse of Islamorada! Sunset Celebrations and live entertainment every night… Voted BEST SUNSET in the Upper Keys year after year. Breakfast, Lunch & Dinner served waterside. Now open until midnight! Look for the mermaid at MM 82, bayside. Located in the heart of Islamorada at mile marker 81.6, the Morada Bay Beach Cafï¿½ & Bar is an outdoor Mediterranean bistro cafï¿½ set in the sand. Situated amidst a glorious, palm-lined beach overlooking blue waters, with walking paths thru tropical flowers and a thatched forest, The Cafï¿½ offers inside and outside bars and dining areas, live unique entertainment, spectacular sunsets, and a large child-friendly beach with giant Adirondack chairs. The Cafï¿½’s menu is a blend of Caribbean and American cuisine. The Cafï¿½ and its white sand beach at Morada Bay are available for private sunset beach weddings and receptions, photo-shoots, and other special events, including private parties and large group reservations. Open for lunch and dinner daily. Famous Full Moon Parties Monthly. Enjoy French Fusion cuisine with world influences at Pierre’s Beachfront Lounge And Restaurant At Morada Bay. Zagat rated “Extraordinary To Perfection”, dine indoors or watch a beautiful sunset from the wraparound balconies at this elegant plantation style house with stunning decor. The upstairs dining room features Tibetan monastery doors and Moroccan, Indian, and African tapestries, wall carvings and artifacts. The Green Flash Lounge has oversized wooden reclining couches on the beach and wicker chairs on the veranda for sunset viewing. Indoors features a wide variety of cordials, wines, and cigars from around the world set amidst dark mahogany woods and heavy leather chesterfield sofas. Pierre’s Restaurant and its white sand beach at Morada Bay are available for private sunset beach weddings and receptions and other special events. Famous Full Moon Parties Monthly. Located at Mile Marker 81.6, Bayside. Tower Of Pizza Italian Restaurant… Enjoy genuine Italian cooking in the heart of Islamorada. Dine in our downhome atmosphere or take your order out. Free delivery to your home, office or hotel (within Mile Markers 74 thru 88). Wahoos Bar and Grill… The best ocean view in the Florida Keys! Perched above the world-famous Whale Harbor Marina at mile marker 83.5, Wahoo’s Bar and Grill offers the Key’s freshest selection of locally caught fish and seafood including mahi-mahi, grouper, snapper, tuna, stone crabs and Florida lobster that come right from our docks. Recently voted as the 3rd Best View in the Miami Herald’s “Best of South Florida” Reader’s Choice Poll, Wahoo’s commands truly spectacular views of the Atlantic Ocean from every seat. Wahoo’s offers both an indoor and outdoor bar to help you lose track of time while here in paradise. Just don’t forget about our fantastic happy hour which is available Monday through Friday from 4pm to 7pm. Open daily for cocktails, lunch and dinner. Whale Harbor Restaurant and Marina Join us at the brand new World Famous All-You-Can-Eat Seafood Buffet for Islamorada Waterfront Dining at its Best! After an electrical fire in November of 2013, the brand new Whale Harbor Seafood Buffet is now open! 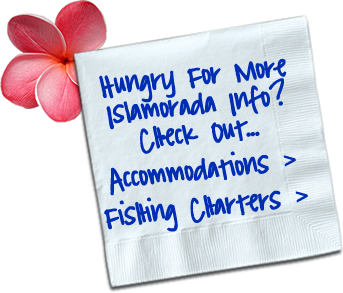 An Islamorada landmark since 1974, it was given the honor of being named “One of the best seafood restaurants in the country” by The Food Network. The world famous Seafood Buffet is recognized for having a delectable and diverse 85 item spread ranging from an impressive raw bar that offers crab legs, oysters, mussels, and shrimp, to mouth-watering meat selections like hot, carved beef and fall off the bone ribs. Located at MM 83.5, Oceanside. Come on in! The Whistle Stop Bar and Grill is a great place to meet friends, have a cocktail, grab a bite and kick back while enjoying your favorite sporting event. The fun never ends in our “Cheers” like atmosphere…. our full service bar is open everyday from 11 am to 3 am with Daily Happy Hour from 4 pm to 7 pm and a Late Night Happy Hour from 10 pm to 12 am on Tuesdays, Wednesdays and Thursdays. Hungry? Grab a snack from the Whistle Stop Grill menu. We pride ourselves on our cleanliness, food quality and modest prices! We Are Conveniently Located In Downtown Islamorada, Mile Marker 82.5, Oceanside.